Building a replica Lee Enfield No4T maybe a cheaper alternative to the original rifle but it is still fairly expensive option and therefore is not to everybody's taste. Utilising S&K mounts from the US, TVG can provide a scope base suitable for your classic rifle. There is a wide range of models to fit most classic military rifles. These are good mounts that provide a number of options in terms of ring types and sizes. 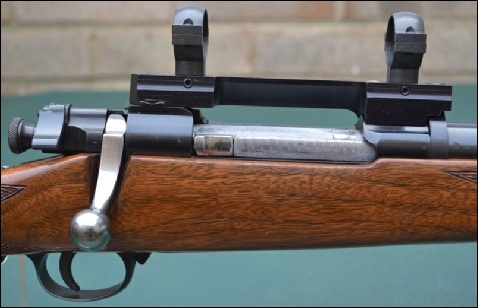 S&K can supply a Weaver base, where you can supply you own rings or there is the S&K base which has its own rings, either way one of the most attractive feature of these mounts is that the rifles receiver does not have to be drilled. TVG has been fitting these mounts for a number of years and although billed as a non-gunsmithing mount, some do require fitting, removal of wood and all of them have peculiarity's that the shooter will not necessary be aware off and make fitting frustrating or worst still a disaster. Besides the obvious cost benefits to these designs, shooters opt to use these mounts for a number of reasons. The most common are to improve the rifles performance or mounting a scope as the shooter can no longer utilise the iron sights due to deteriorating eyesight. In my professional opinion scopes sizes should remain moderate to retain the character of the rifle and therefore the scope should also be of a classic design. The MAS 36 mount is one of the few designs that I have encountered that requires no alteration of the rifle at all. The shooter must remove the rifles rearsight and fit as per S&K’s instructions. However the unusual bolt handle design means that the base is slightly off-set to the left and limits the number of scopes you can fit. The base is only available as a weaver base and the classic weaver 2.5 is ideal as the scope sits low for good cheek weld and avoids any conflict with the bolt handle. The pictures depict only the 1903A3 model and shows the S&K base although it is available as a weaver model. The base secures using a band around the receiver and a clamp to the rearsight dovetail. However wood has to be removed to permit clearance for the band and the upper hand guard cannot be fitted unless it is modified. This is not a problem for the 1903 rifle. 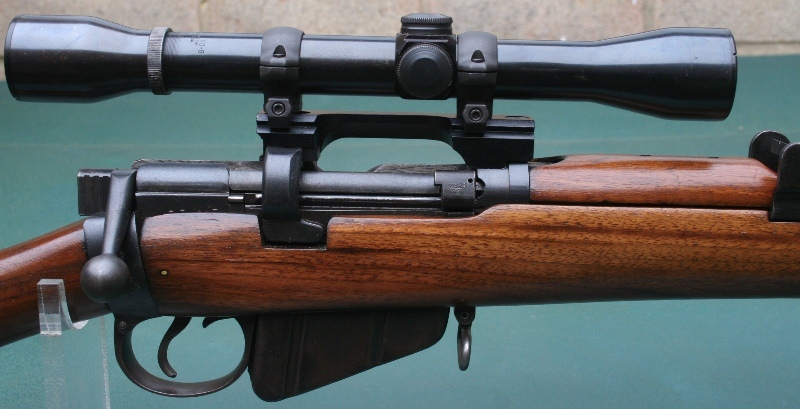 The SMLE is a difficult rifle to fit a scope too because of its split receiver design. S&K’s base is the best available option without drilling & tapping the receiver. The base clamps onto the charger bridge and uses a band to secure the front of the base to the receiver. Like the Springfield it does require wood to be removed from the stock to facilitate clearance for the band. However if done professionally it is hardly visible. Whilst available as a weaver base the S&K model is superior as it keeps the scope height to a minimum and therefore maximises check weld. The No4 mount is only the second design that I have encountered that requires no alteration of the rifle at all. The shooter must remove the rifles rearsight and fit as per S&K’s instructions. The base is available as a weaver or as a S&K style, however I would recommend the S&K style base as it is in my opinion a superior design. Scope should be limited to a 1” tube and with a object lens of 40mm otherwise the scope can conflict with the upper hand guard.